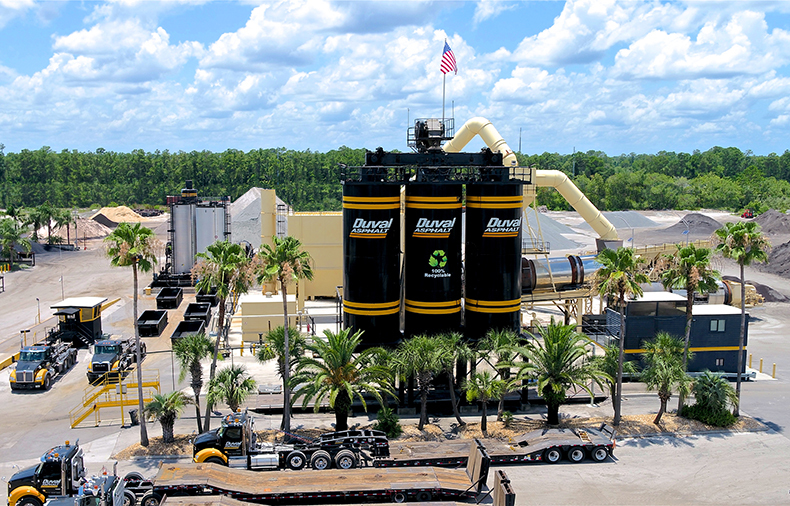 Duval Asphalt is proud to be Northeast Florida’s leader in asphalt manufacturing. Our state-of-the-art asphalt plants and facilities use custom asphalt mix designs to meet the specific quality and budgetary needs of each project. We test each asphalt mix, giving you the highest in quality standards available today. In addition, we have been honored with numerous industry awards for our commitment to the environment. Our air pollution control equipment exceeds current state and federal environmental regulations. We are the Asphalt Manufacturer – Buy Direct! Hot Mix Asphalt (HMA) is a combination of various sized stones and sand, known as aggregate, bound together by liquid asphalt and blended to form a harmonious mixture. These hot mix asphalt mixtures are produced at temperatures between 275 and 325 degrees Fahrenheit and must be installed before the temperature falls below 260 degrees. Hot mix asphalt is placed in dump trucks at the asphalt manufacturing plant and transported to the paving site for installation. 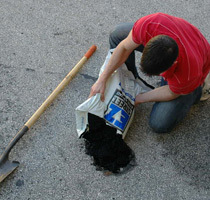 EZ STREET is a polymer-modified cold mix asphalt guaranteed to permanently repair potholes, utility cuts, and edge repairs in asphalt or concrete. 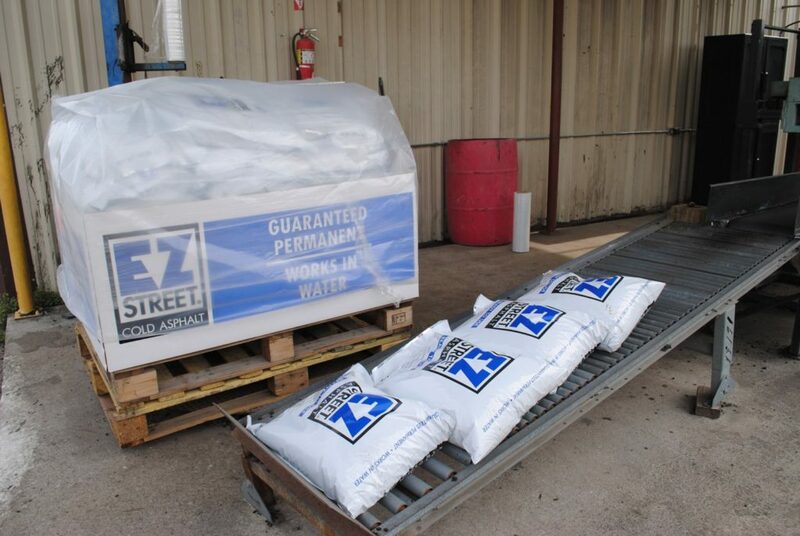 EZ STREET is currently being used by State DOT’s across the country in bulk and bag form. Not only does EZ STREET work in ALL weather conditions, it even works in water. 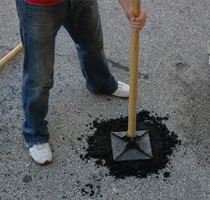 EZ STREET cold asphalt is easy to apply and requires no mixing or tack coat. 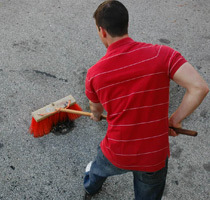 Simply sweep the area, fill the area with EZ STREET cold asphalt and compact with a shovel or car tire. It really is EZ! Potholes, Utility Cuts, Edge Repairs, etc. Do it Yourself! Cold Mix Asphalt in Three Easy Steps! EZ STREET’s 35-pound and 50-pound sizes are a manageable, user-friendly quantity at an affordable price. Using the world’s most advanced packaging medium, and through a unique multi-layer manufacturing process containing barrier enhancement materials, EZ STREET offers a 1-year shelf life unequalled by any other product in its category. The bottom line: EZ STREET® cold mix asphalt looks better, lasts longer, and makes it all much easier. EZ STREET Bulk is used by large contractors and government agencies in lieu of conventional hot asphalt. EZ STREET Bulk makes quick work of permanently repairing potholes, utility cuts and small overlays. The bulk format also means a repair product that’s immediately accessible whenever and wherever you need it. EZ STREET cold asphalt is produced through conventional asphalt plants utilizing proprietary processes. Our EZ STREET is customized for optimum performance across a range of ambient temperatures. Once made, EZ STREET cold patch asphalt has a 6-month stockpile life.